My partner was looking for a white watch for a while and I was so glad I found this one. Watchshop sent the incorrect box for the watch which was a adidias box so I was very glad I did not pay for it to be gift wrapped or I would of never known as the guarantee and the instructions were also incorrect. Took a few days for a response but I the right box was sent. I ordered this after searching for ages trying to find a white watch and must say I am not disappointed. Like most Diesel watches it is quite a large watch face so maybe for a petite female it might not be what you are looking for. I think on an average male wrist though it doesnt look too much. The strap is a rubbery material which feels really comfortable and you forget you are wearing it half the time. Great value for money and a worthwhile purchase. Great product super quick delivery. Very happy. this watch is very nice, wears comfortably, not too big, simple but effective design. The watch has lived up to my expectations I was worried it would be too big for me as it is unisex, but it fits albeit with an additional hole in the strapand the face is not too big and I have very small wrists. Very comfy and easy to read the dial. No more to say, I think 64 pounds is good value for money. Really like this watch. Good quality for the price. Feels sturdy. Simple and contemporary. Perfect casual, comfortable watch in white, which pretty much goes with everything. Also water resistant so I could use by the pool on holiday. I am so happy with the watch I have purchased. It has a rubbery strap with lots of holes for many different sizes so it is able to fit on anyone no matter the size of your wrist. The face is made from metal/plastic which is very robust. It feels very nice on my wrist and most of the time I dont even realise it is there because of how light it is. I wanted a watch with a big face because I have big hands, and this watch is perfect for that, its not so big that it looks silly but big enough to look good. The design itself on the watches face is so unique compared to other watches and is very nice to look at yet still easy to understand. The whole watch is a Snow White except for the 2 hour and minute hands which are black and also the crown used for changing the time is silver. I suggest this watch to anyone looking for a affordable yet stylish watch. This watch was an excellent Christmas present my partner was over the moon at it is really good value for money. Would definitely come back to watch shop again. Excellent delivery! Get all my watches from here great for presents. Great gift wrapping!! 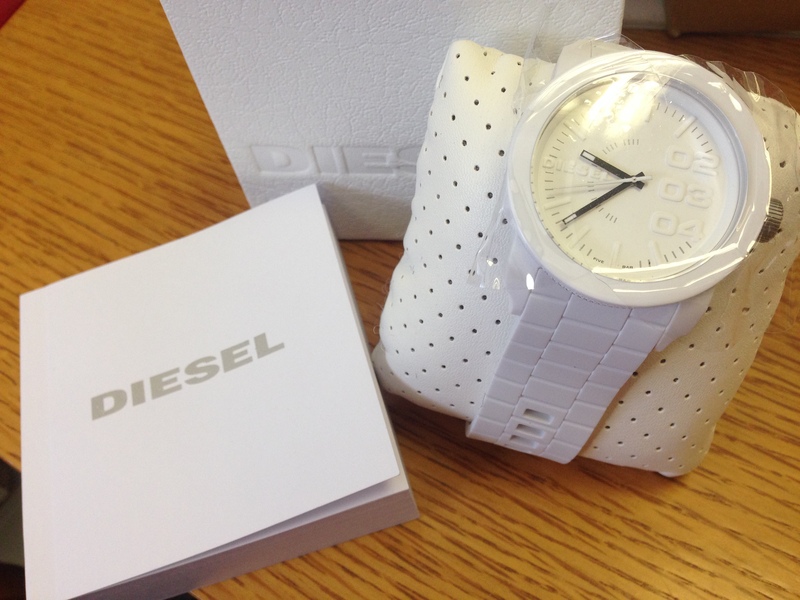 I purchased the Unisex Diesel Franchise Silicone Watch yesterday morning and to my delight it arrived today. Generally, I dont wear watches however I saw this one in the window of a jewellery shop at the weekend and the slick white design with black hands caught my attention! also loved the quirky hour mark detail at 2, 3 & 4! In the past when Ive worn watches Ive found them to sometimes be uncomfortable however the silicone strap makes the product really comfortable. The added benefit of water resistance means that I wont have to worry about taking it off when swimming on my holiday in two weeks! Also comes with a two year warranty. Very happy with my purchase! Had already purchased this in black so knew it would be comfortable to wear and perfect for casual use. Didnt disappoint - lovely watch. Fantastic watch, second time ive bought the same one my puppy ate the last one he liked it so much!! and if he eats this one i will buy another one as well! Really comfortable, light weight, looks flashy and easy to read. Would highly recommend. A lovely, light watch that fits well on a womans hand. Bought it as a gift for my friend and she loves it! a modern watch that looks good!! accurate product as advertised, very stylish and trendy,discounted price then high street. Lovely watch, it is very light and comfortable to wear, it is white, with black hands and just has the numbers 2,3 and 4 on it and Diesel written on it in raised white writing. on the back is the diesel logo. Its water resistant, has a silicone strap and metal clasp. Its not too small, considering its unisex.Its just a shame it doesnt have the date on it. I would recommend it, I have 2 diesel watches now and they are fantastic. Item came extremely quick via a recorded delivery. In perfect conditon and got it at a bargain pprice compared with othe Watch Retailers. Would definitely use Watch Shop again. great looking watch just perfect for my son. The fact that it is a strap rather than a bracelet is good no need to mess about with links having to be taken out especially as it is an xmas present. Good size too. Be careful if buying that you go for this medium size one I nearly made a mistake in getting the larger face which would have been enormous. I would say that this one is a normal size gents watch face. Beautiful, very good quality and a fantastic present. Would recommend to all. Very fast delivery also :) thank you. Very nice watch and very summery. I love the plastic band and how light it feels. 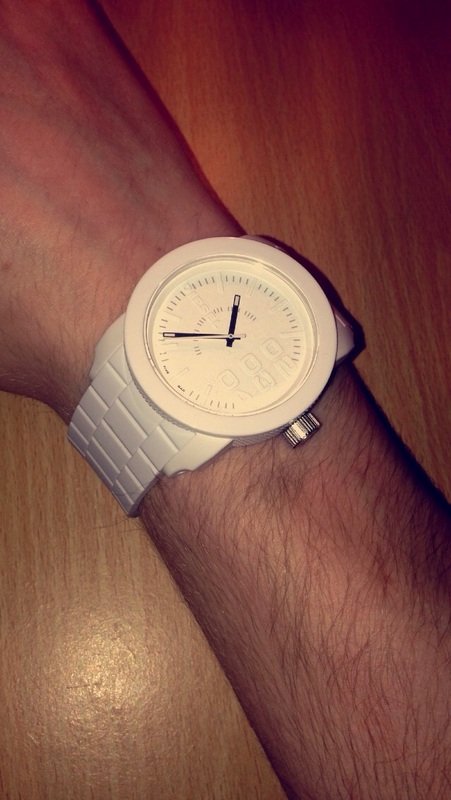 Size is great on my hand even though Im a big guy and I dont necessary think that white watches are for girls only! I bought this watch as a birthday present for my wife. She absolutely loved it - I had got it right ! BUT - it doesnt work so it has to go back, Ill get the exact same one as replacement though. I bought this time piece for my son who is delighted with it. It is great as there is no need to have links removed for fitting, to quote "it is the business" so that must nean its a good buy for the lads. This is a lovely watch and very good quality.The white colour was particularly on trend and a very easy dial to view. We are delighted and would highly recommend. Great watch, love the feel of the rubber strap and the large face. The detail on the watch face is great with a combination of indications and numbers. A great purchase! 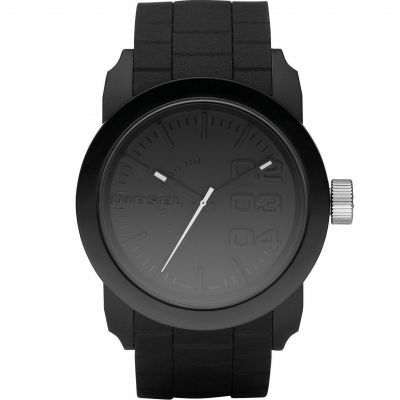 The Diesel Young Blood Watch is funky and trendy. I love the big face and the way it is laid out with just three digits and all in white. The strap is also white and made of a rubber like plastic. I had looked around for a while to find the watch that I wanted and this definitely matched my requirements!